Looking through the visitors’ book at a stunning Welsh farmhouse in the hills overlooking Fishguard Harbour, words like ‘bliss’, ‘peaceful’, ‘stylish’ and, of course, ‘eco’ jump off the page. What strikes me as strange, however, is that apart from me, none of these happy holiday makers is Irish. And yet, Rosslare is only two hours away on the express ferry from Fishguard. 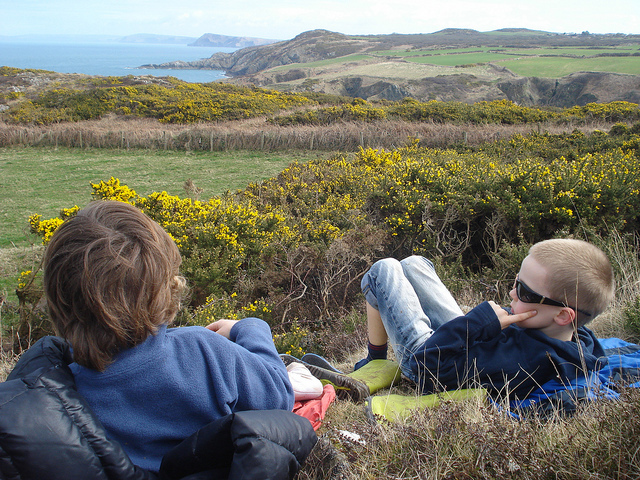 For 35 ash cloud safe Euros (plus 8 euros to take your bike) you can walk off the gangplank and straight onto the Pembrokeshire Coast Path, with its 300kms of secret coves and infinitesimal seascapes. Stena Line also does very good combined sail and rail deals (stenaline.ie), with a station at the port for onward travel. 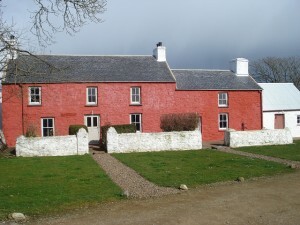 This 1830’s farmhouse, called Trehilyn Uchaf (meaning Upper Heulyn’s Town), has been restored with care and expertise, retaining original qualities, as well as sustaining it into the future with renewable energy, reed bed waste system, sheepswool insulation, and many other natural attributes. Because restoration and sustainability is what Under the Thatch is all about, a Welsh company set up to do just that, and the source of our weekend’s escape. It is also about quality and quirkiness and has won sustainability awards, thanks to the passion of it’s owner, architectural historian Greg Stevenson, who not only likes to see such buildings being used, but used all year round. Thus, he keeps prices affordable so they are always in demand, and remote villages benefit from tourism for more than two months of the year. 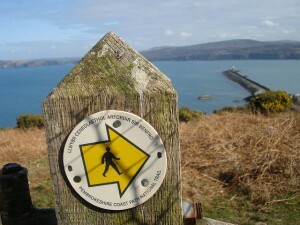 Such as Fishguard, where he has a few gorgeous places to stay, some walkable from the ferry. Trehilyn Uchaf itself is pure eye candy for the urban dweller who dreams of a rural retreat. Falling down with Farrow and Ballness, a bathroom that is bigger than my flat, antique furniture, it’s a fusion of classic and contemporary done without a bother. It is also a walkers’ dream. 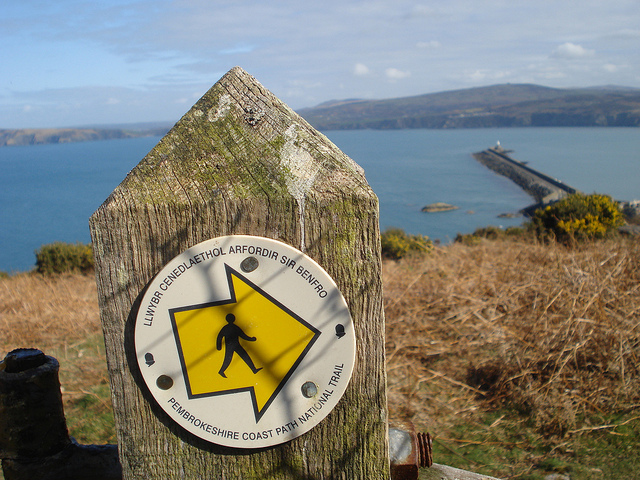 We walk overland to the Pembrokeshire Coast Path, starting at Carregwasted Point, and follow the Path for about 9k.It’s a great place for spotting bottle nosed dolphins too, although a bit early in the year for us, sadly. Later in the season you can do ‘Strumble Watches’ for marine life with Seatrust. A couple of pints and great chips at Goodwick’s Rose and Crown pub at the end of the walk, we collapse onto the Strumble Shuttle bus, which takes us back to the farm. We have no need for our car, getting supplies at the supermarket twenty minutes’ walk from the port, and then a 7k taxi ride to the farm. Later in the weekend, we head off on a walking trail over the fields to Fishguard, with its variety of small shops for local produce. If you do want to bring a car, there are three other converted buildings on this farm, including an eco-chic converted mill. The whole farm sleeps nineteen people, great for a big getaway, and only one party needs bring a car. You could extend your stay and take a train or bus to one of Under the Thatch’s other quirky offerings, such as a railway carriage in Cardigan, a romany caravan in Llangrannog, or a shepherd’s hut in the foothills of the Black Mountains. Ironically, Stevenson’s favourite thatched one is in Ireland, a cottage with vintage caravan, called Geaglum, in Fermanagh, also on the website. Green and gorgeous, these breaks are just across the water, accessible by public transport, sustainability at their core and, most importantly, in locations where the wilderness, and often the wind, will not only blow off the cobwebs, but blow you away too. This article was first published in The Irish Times. This entry was posted in Articles and tagged accommodation near Fishguard, cottage Wales, ferry ireland to Wales, Fishguard, green places to stay in Wales, Pembrokeshire Coast Path, under the thatch, wales. Bookmark the permalink.